We loved them at first but one broke down after less than 2 months and one with fan makes a lot of noise. I ordered another one for spare and it's dead on arrival. I think they really have quality control with this product. It's better to stay away. I'm switching to Warring brand now. Thank you for your review! We are sorry to hear this range has not worked well for you. A Customer Solutions Specialist is currently assisting you. Purchased item on January 6 2016. we use this item about 8 to 10 times per week for around 10 to 15 minuets each time so around 1.5 up to 2.5 hours of use per week. after 8 months it has started over heating the small fan is not cooling the item or it just can not stay on for more than about 3 to 4 minuets per use and then needs to rest for about one hour before you can use it a gain for 3 to 4 minuets. We keep the unit clean and do not let water near back or bottom, just not made for commercial use. if you were looking for something for a home cook might work but commercial will not hold up. Thank you for the review, Brian! We're sorry this induction cooker has not lasted for you. A Customer Solutions Representative will contact you shortly. We appreciate your review, Michael! A Customer Solutions Representative will be contacting you shortly. I would give this 5 stars but both quit working within a week of each other, and we are just a few months outside of the warranty so we are out of luck. We have had these for less than a year, and they dont work, feels like a waste of money and the warranty should be a year at least for the price! Really disappointed with this, it has put our business in a tough spot and a loss of money. Nothing good about it! Thank you for your feedback! We’re sorry this cooker did not meet your expectations. For recommendations, please contact our Customer Solutions team. Thank you for your feedback! We’re product did not last in your operation. For recommendations, please contact our Customer Solutions team. I got this induction cocker two month ago, but I just use it for one month and it stop working now. Very disappointed! I brought two, let’s see how long another one last? Thank you for your review, Yalun Lin! We are sorry this Avantco IC3500 Countertop Induction Range / Cooker - 208/240V, 3500W has not worked well for you. A Customer Solutions Representative will contact you soon! I have to concur with every other reviewer that this product does not last. it only lasted 8 months and than every few minutes E01 overheating. We are only moderate user. Good price but not quality. It lasted one year then died, not a big fan of Avanto products, they all end up to break very soon I would definitely not recommended it. Thank you for your review! We are sorry this did not work out for you. For higher volume establishments, we recommend choosing a higher wattage, which will offer more power. For more information on how to choose an induction burner that will best suit your needs, check out Choosing Induction Equipment. I will give this item 2 stars only because it works well. The problem is that it doesn't last. I had the first one quit on me entirely after a few months of light use. They replaced it with no problem, but after a few more months the second one did the exact same thing, now it's out of warranty and they won't do anything about it. If you need it for more than 6 months don't buy this one. Thank you for your review, Cory. We are sorry this item did not last as it should have for you. A Customer Solutions Representative will contact you shortly to arrange a credit for the faulty item. I purchased 4 of these and 3 of them stopped working within the first year. I was told that the product comes with 6 months limited warranty which meant all of the cookers ended up in trash. The cooker is amazing when it is working and does all that is displayed on the website. I just wished they were more durable. I will have to look for other options in the future. We appreciate your feedback! We’re sorry this didn't work out for you. If you are looking for a new unit, please feel free to reach out to our Customer Solutions team for assistance. Thank you for your feedback! We are sorry your Avantco IC3500 Countertop Induction Range / Cooker - 208/240V, 3500W was defective. Corrective action has been taken and a Customer Solutions Representative will remain in contact with you about this. We appreciate your review, Karsten! We are sorry this induction range stopped working for you. Unfortunately since this item is past warranty, this item is no longer covered. If you have any other questions please contact our Customer Solutions team. I really, really wanted to love this cooker. It's gorgeous. Heats up really quickly. Goes down to a simmer just as quickly. Oh, and did I say it looks really nice? Unfortunately, that high-pitched squeal makes it almost impossible for me to use it. I guess in a really loud kitchen, one might not notice it. I, unfortunately have dog ears - for example, a friend of mine has those plug-in ultrasonic pest repellent things and I can hear them when I walk into her house. Same thing here - while most people may not even hear them, I do. And boy is it a migraine-inducing sound. If not for my ears, this item would get 5 stars. We appreciate you review, Auria! We are sorry this cooker did not meet your expectations. If you ever have any concerns with the product that you purchased, please contact our Customer Solutions team. This is a great unit at a fantastic price. We teach craft beer making and so I didn't have to go out side with a propane burner, we got one of these. It works better than most stove tops at getting up to temp. The rest of the unit stays cool being an induction burner. I would highly recommend this unit. We've been very happy with this induction burner so far. Strong enough to boil a large pot of water quickly for pasta cooking in the prep kitchen, fast recovery too. Burner is a good size even for our largest rondeau. I wish I had 3 more. I bought a supposed 2000 watt induction range last year and liked it. It boils water relatively quickly and handles a stir fry well. However, it does not have a setting that gently simmers food. It either boils it rapidly, or it doesn't boil at all. Fortunately 've given that unit away. This 220 volt 3500 watt Avantco induction range is much better. I enjoy cooking and have used this range 8 times since receiving it a few days ago. I've only used heavy enameled cast iron dutch ovens to cook curries and multi-layered Scanpan fry pans to cook omelets. At the 190 deg. setting it gently simmers the pot. I set the timer to 30 minutes and it worked well. Tonight I reheated some food I'd prepared this morning and used the lower temp. settings to start to warm the pot working up a "notch" each couple of minutes. The end result was nice, hot food without any sticking to the pot and nothing burning. 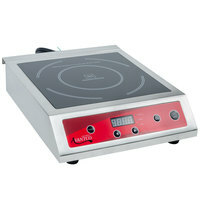 This induction burner works great in our prep kitchen. The sturdy design holds the heavier stock pots & sauce pans. The unit is light and stores away well. I purchased this range to serve as the main heat source for a basement food processing/brewing/canning etc space that I constructed in my basement. While it will require purchasing some new cookware, I am very impressed thus far, the heat control is instantaneous, the output impressive (brought a 5 gallon volume of wort from ~140 degrees to boiling in 15 minutes and maintained a vigorous boil easily) and the unit is very sturdy in its construction and could probably handle stockpots in excess of 10 gallon. I just hope it lasts--but for the price?